Scotland is home to some of the finest prehistoric sites in Europe. Many of the best-preserved of these are located in the Highlands and Islands, perhaps due to their relatively sparse modern populations and consequent lack of disturbance. 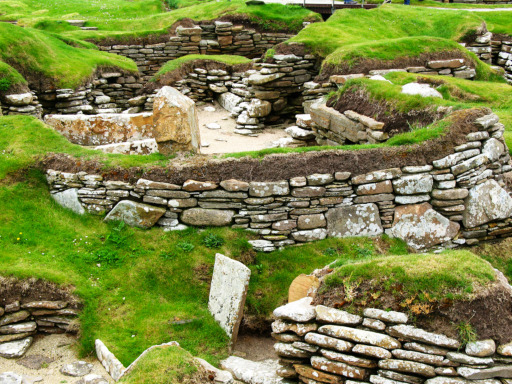 The most famous of Scotland’s ancient sites is Orkney’s Skara Brae – Europe’s most complete Neolithic village. This remarkable stone-built settlement was constructed over 5000 years ago. It flourished centuries before the ancient Egyptians built the Great Pyramid of Giza and was inhabited a millennia before Stonehenge was erected. But what makes Skara Brae especially important is the wealth of domestic details left behind by its inhabitants, giving an evocative and unparalleled sense of the day-to-day lives of these ancient peoples. Skara Brae lies on the Bay of Skaill, on mainland Orkney. It is 19 miles north west of Kirkwall on the B9056 and 7 miles north of Stromness on the A967. 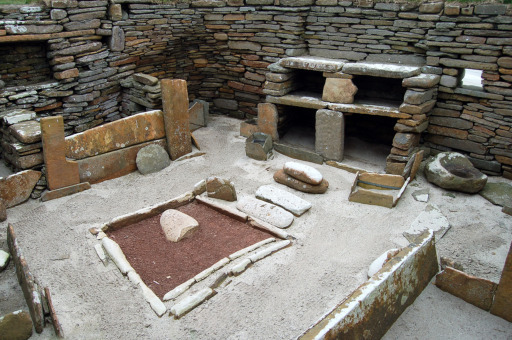 Radiocarbon dating indicates that the occupation of Skara Brae began about 3180 BC. The Neolithic people who built the village were farmers, hunters and fishermen. No weapons have been found on the site, suggesting they lead a peaceful existence. For reasons still unknown, the village was abandoned around 2500 BC, and in time the site was swallowed by wind-blown sand. 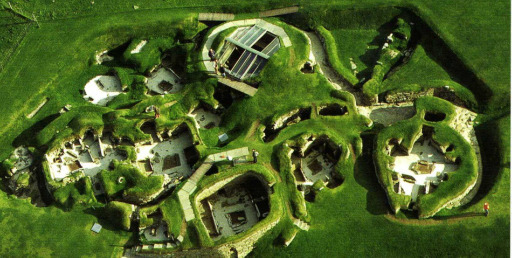 Skara Brae was rediscovered in 1850, when a great storm battered Orkney, stripping the grass from a large mound known as Skerrabra, revealing the outlines of several stone buildings. Subsequent archaeological investigation uncovered a cluster of stone-built houses, linked by low, covered passageways. In the visitor centre, audio-visual displays, interactive exhibits and an array of artifacts discovered on the site – pottery, hand tools, jewelry and gaming pieces – tell the history of the Stone Age village and its inhabitants. Outside the centre is a replica of house #7, that you can enter and explore hands-on. From here you follow a footpath leading to the site itself, the path marked by a series of inscribed stones of major world events, forming a timeline taking you back to 3100 BC. The village itself is spectacularly set above the beautiful white curve of the Bay of Skaill and comprises ten half-buried stone houses, all built of close-fitting, cut stone to the same basic design. The houses all consist of a single large room and feature a number of remarkable stone-built furnishings, including beds, closets, dressers, seats and storage boxes. Each house has a central stone hearth and a few have small waterproof boxes set into the floor, possibly for storing live fish-bait. A sophisticated sewer system connected the houses, with a primitive toilet in each dwelling, and the houses are linked together by a network of covered passageways. Looking inside these dwellings, it’s not hard to imagine the life of these Neolithic people. 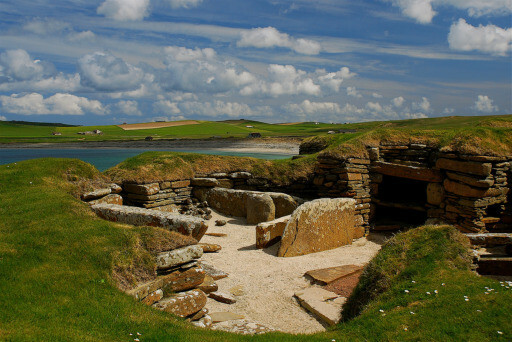 Skara Brae is one of the world’s great archaeological treasures, affording visitors a remarkable glimpse inside the prehistoric world. Monks Mound is situated about a mile from the Mississippi River, just north of East St. Louis, Illinois, in central United States. The Mound Builders statesmanship, ambitious projects and workforce make them one of the most important cultures of World history. The expertise of the ancient engineers that built the mound is shown through a complex layering of materials to build it. Inspection of the construction sequence of Monks Mound reveals that the final size and shape was part of a highly developed plan. All carefully layered stages of construction proceeded quickly as shown by a complete absence of erosion or layers of vegetation found between layers. 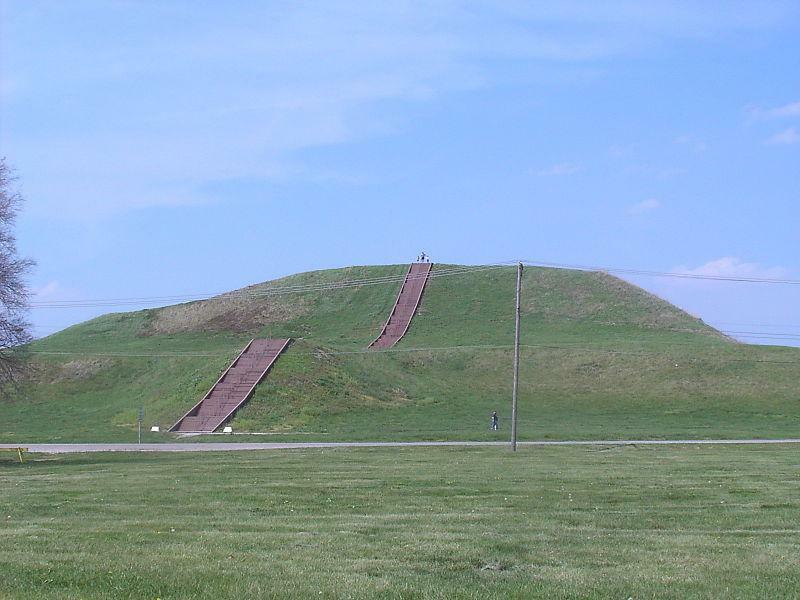 The mound has dimensions of 92 feet in height, 951 feet (290 meters) long and 836 feet (255 meters) wide. Monks Mound base covers about 14.4 acres and has a volume of about 21,551,623 cubic feet (610274 cubic meters) and consists of more than 2.16 billion pounds of non-local soil types. Other construction materials used in the mound include limestone slabs, bald cypress and red cedar posts. Use of the limestone slabs in mound construction is important as a chronological marker indicating late Archaic construction (3000 – 1000 BC). Construction materials for Monks Mound included only colored soil that is not found in the surrounding alluvial floodplain. The location of origin of the colored soil used in the construction of Monks Mound is now being researched. Soils were likely selected for their vivid color and brought in on rafts or on foot from hundreds of miles away. The blue, red, white, black, grey, brown, and orange soils colors were layered in varying thickness and areas throughout the mound’s entire construction. The energy required to move 43.1 million baskets to a great distance and then construct the mound is staggering. Text by ©Vince Barrows, USA. The story was first reported by Mr.Leonardo B. Romano from S. Agata. An Italian magazine published his text and fotos in Oct.2008. Gabriela Lukacs got in contact with sig. Romano in Santa Agata dei Goti. 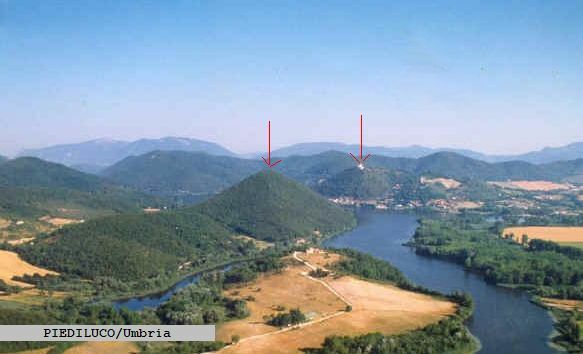 She visited the location twice (Nov.2008 and Oct.2009) and was able to verify the existence of the alleged pyramid and the stone balls.A pyramid shaped hill with distinct edges and pin point top can be seen from S.Agata town. Best view from the restaurant terrace of “Finestra Catalana”. Vegetation: Olive trees grow on terraces built from dry stone walls. The terraces extend up to the top of the hill on its town facing side. 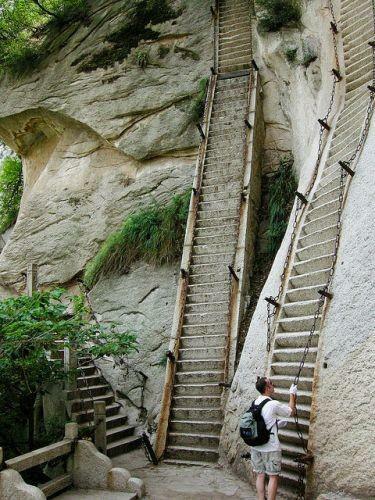 Access: No street or pathway is leading to the top. A footpath follows the 17th century aqueduct bringing water from Mt. Taburno to the Caserta Royal Castle. The water tower marks the edge of the pyramid hill. Excavations: Nothing is known so far, no excavations ever made at the hill. The area is inhabited since prehistoric times. An ancient city, Saticula, mentioned by Homer, is said to have existed in the area of S. Agata in 343 B.C. Current construction works for the Superstrada to Benevento have brought to light prehistoric tombs and pottery. Devil’s footprints: A sensational discovery was made in 2007 near S.Agata: the oldest footprints of man (homo erectus) in vulcanic ash. 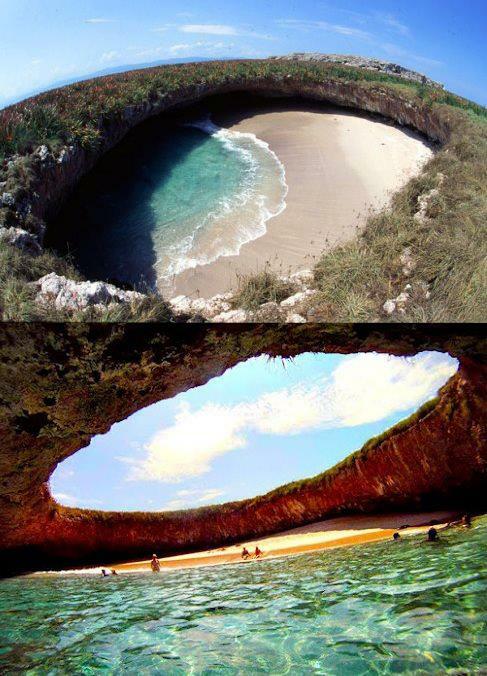 Tunnels: An extensive underground tunnel complex is reported by local people. Stretching between S.Agata town and the pyramid hill. It was detected during the gas pipe construction works 15 years ago. Stone spheres: mysterious stone balls are found in the area of S. Agata since generations. They can be admired in private homes and gardens. Conical hill: There is a perfect conical hill in the village of Moiano, next to S.Agata, in viewing distance from the pyramid hill. It seems to be a tumulus or cairn. 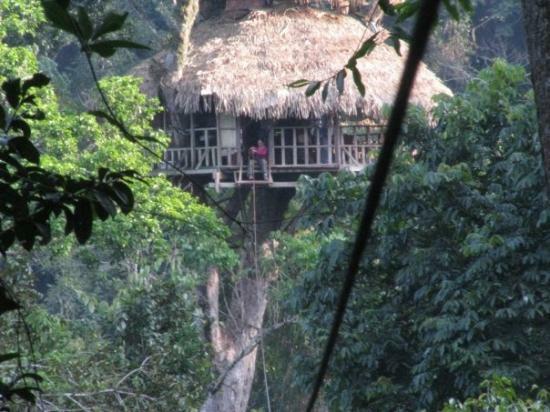 Gibbon Experience is Ten tree houses, connected to one another by eighteen miles of zip-lines, perched 150 feet above the forest floor in northern Laos. It was founded by Frenchman Jean-François Reumaux in 2004.